How Much Do BI Tools Cost? You probably use Excel (a.k.a. the DIY business intelligence route) to currently understand your data, but a better option exists—one that doesn’t require manually gathering, storing, and organizing your data before you can review it. That option is a BI tool. BI tools are not just a better option for making sense of your data, they are the best option if you are looking to become a truly data-driven company and experience better growth. You’re probably wondering how much a BI tool is going to cost. When deciding which BI tool is right for you, research and advisory company Gartner recommends you first consider the business benefits of implementing a BI tool in your business model and then consider the price. 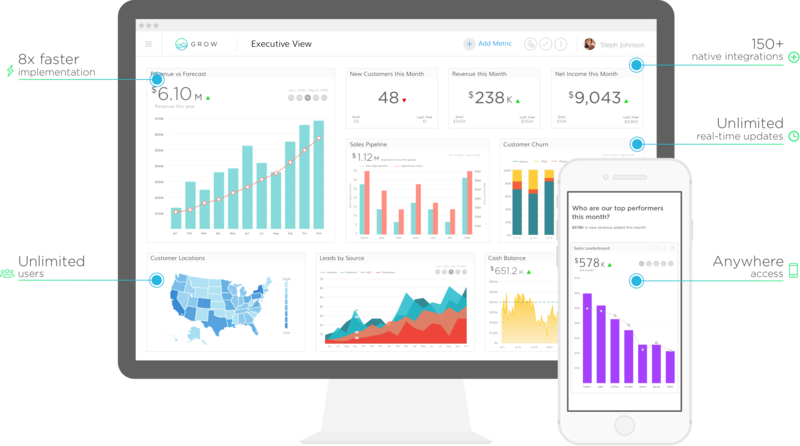 Apps today can collect info about your marketing and sales performance, financial details, merchandise levels, and a variety of other data. This data is a vital company asset you can capitalize on with a BI tool. BI tool costs vary from $20 to a few thousand dollars a month. The amount varies based on how many users or metrics you choose to track. You don’t want to overpay for capabilities you don’t need, but you also don’t want to underpay and not receive needed functionality. It’s important to choose a BI tool that can easily scale with your company as it grows. That way, you don’t have to learn to use a new tool after experiencing some growth. With your current analytics solution, how accessible is company performance data at decision time? Is it five minutes out, two days, a week, longer? What opportunities do you miss while you wait for your data? With BI tools, your data can be available instantly. When data is easily accessible, it’s easy to see that companies using analytics are five times more likely to make faster decisions. A recent Aberdeen report showed 63% of best-in-class companies that implemented BI experienced improvement in time-to-decision over the past 12 months. Not using a BI tool could be costing you the ability to make faster decisions in today’s fast-paced business world. With your current analytics solution, how many employees does it take to create reports? One to three, four or more? The average salary of a data analyst is around $60,000. If you need more than one … it becomes quite expensive. BI tools automatically collect and sort data. By automating your reporting, you can save a minimum of half of what it would cost to hire a data analyst. Or you can allow current employees (or yourself) to spend time on other projects. Not using a BI tool unnecessarily ties up employees, hurts productivity, and costs you additional money. Do you feel confident about your ability to stay competitive in your industry with your current analytics solution? BI tools can help you gain a competitive edge. A 2016 survey by MIT Sloan Management Review showed a sharp rise in the number of companies saying their use of analytics helps them beat the competition. BI tools are great news for SMBs. BI tools help SMBs gain a competitive edge on larger competitors. Not using a BI tool could be costing you your competitive edge. With your current analytics solution, are your employees able to make decisions which benefit the company as a whole and not just their department? BI tools unify your company with real-time updates of company performance everyone can see. Every day, employees from the top down make decisions which impact the direction of your company. Here at Grow, we review our KPIs weekly during team meetings to see what adjustments we need to make to positively impact our company. Siloed information, available with Excel or similar reporting solutions, prevents employees from performing their jobs well and making well-informed decisions. With access to the right information, employees can perform better and make decisions that will help take your company in the right direction. Not using a BI tool limits your employee’s ability to jointly work towards the same goals. Ready to learn more about what BI tool can do for your business? Request a demo!